In this article, we will install Solr using its binary distribution. One 1 GB Ubuntu 14.04 Droplet at minimum, but the amount of RAM needed depends highly on your specific situation. Solr requires Java, so in this step, we will install it. The complete Java installation process is thoroughly described in this article, but we’ll use a slightly different process. You will need to press ENTER to accept adding the repository to your index. Last, install Java 8 using apt-get. You will need to agree to the Oracle Binary Code License Agreement for the Java SE Platform Products and JavaFX. In this section, we will install Solr 5.2.1. We will begin by downloading the Solr distribution. First, find a suitable mirror on this page. Then, copy the link of solr-5.2.1.tgz from the mirror. For example, we’ll use http://apache.mirror1.spango.com/lucene/solr/5.2.1/. In this section, we will create a simple Solr collection. Solr can have multiple collections, but for this example, we will only use one. To create a new collection, use the following command. 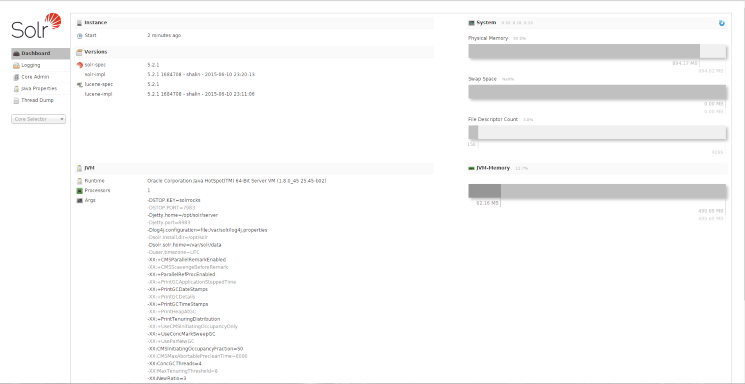 We run it as the Solr user in this case to avoid any permissions errors. In this command, gettingstarted is the name of the collection and -n specifies the configset. There are 3 config sets supplied by Solr by default; in this case, we have used one that is schemaless, which means that any field can be supplied, with any name, and the type will be guessed. You have now added the collection and can start adding data. The default schema has only one required field: id. It has no other default fields, only dynamic fields. If you want to have a look at the schema, where everything is explained clearly, have a look at the file/opt/solr/server/solr/gettingstarted/conf/schema.xml. In this section, we will explore the Solr web interface and add some documents to our collection. The web interface contains a lot of useful information which can be used to debug any problems you encounter during use. Collections are divided up into cores, which is why there are a lot of references to cores in the web interface. Right now, the collection gettingstarted only contains one core, named gettingstarted. At the left-hand side, the Core Selector pull down menu is visible, in which you’ll be able to selectgettingstarted to view more information. You can add more documents, with a similar or a completely different structure, but you can also continue with just one document. There are many more options available, but you have now successfully installed Solr and can start using it for your own site.